Candidates Jorg Dubin, Judie Mancuso, Peter Blake, Toni Iseman, Sue Kempf, Allison Mathews, Cheryl Kinsman, Paul Merritt, Lorene Laguna, and Ann Christoph were given anywhere from 15 seconds to three minutes to answer questions at the Stu News/KX 93.5 Candidates’ Forum. The forum was broadcast on the local station and posted on the Stu News Facebook page. For those who missed it, here is Part Three. Christoph: “I think it’s not really in the scope of the City to manage people’s families.” She opined that finding housing for young folks might be an incentive to stay. Dubin: “We’ve turned away from our non-conformist origins to become Mission Viejo by the Sea, and we’ve got to stop this”. How many police officers do you think we are short right now, if any? Mathews, Kinsman, Merritt, Laguna, Dubin, Mancuso, Blake: All said more officers are needed, but did not specify a number. Christoph: She said her neighborhood doesn’t need very many policemen, although some of the beats are very large. Iseman: She suggested the City might increase beach patrol officer numbers, which cost less than sworn officers, she said. 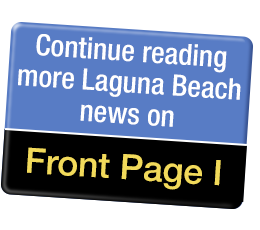 Question: Do you support the [Laguna Beach County] Water District returning to its independent status, breaking away from the City? Kinsman: “They should be separated,” said Kinsman, a member of the district commission. Merritt, Laguna, Mancuso, Blake and Iseman: All agreed with Kinsman. Kempf: Declined to answer without further study. Question: Would you support fining commercial landowners whose properties remain vacant past a certain point of time? Kinsman, Merritt, Dubin, Mancuso, Blake: No. The City has an extra $10 million. What is the first thing we should spend it on? Merritt: Put it in the rainy day fund and get some more cops on the streets and think of ways we can protect the ocean and the future against international ocean pollution. Laguna: I would put that money into our emergency fund. Mancuso, Kempf, Blake, Matthews and Kinsman: All would put the money into fire prevention. Blake, Mathews and Kinsman would also spend it on hiring more police officers. Kinsman added lifeguards and sewers to her response. Published answers, including paraphases, are limited to those that responded directly to the questions asked.